What should be the contribution of the faith-based sector to the shaping of a more just and sustainable future for our society? This was the central question at the conference held today in the Skainos Centre, Belfast, a joint endeavour of the Northern Ireland Catholic Council on Social Affairs and the Community Faith Forum. At a time of economic and social crisis, faith communities are offering a vital lifeline to those struggling to maintain an acceptable standard of living and provide for their families. The conference explored the challenges to our current social model, with participants arguing for the need for the faith sector to be more pro-active in supporting policy makers in the development of alternative solutions that would offer better protection to the most vulnerable members of our society. Photographs from the conference will be available to media for publication. Please contact Neil Harrison, Tel: 0044 (0) 7737474034, email info@neilharrisonphotorgaphy.com. The Community Faiths Forum is funded through the Voluntary and Community Unit (VCU) of the Department for Social Development (DSD). The Forums work is administered by the Churches’ Community Work Alliance NI, and overseen by Eddie McDowell, CCWA Director, on behalf of a steering group consisting of members of CCWA’s management committee. The Forum is designed to be a forum for discussion of social and community issues. It includes five members from the Bahai, Jewish, Hindu, Muslim and Sikh religions alongside 20 members drawn from various Christian traditions. Social issues such as poverty, housing, Shared Future and volunteering, and community engagement will always be the primary items on the agenda for discussion and this will have relevance for the entire community and for all faith groups who seek to help disadvantaged, excluded or marginalised people in local communities. Peadar Kirby is Professor Emeritus of International Politics and Public Policy in the University of Limerick and, until 2011, was director of the Institute for the Study of Knowledge in Society (ISKS) at the same university. Before becoming an academic, he worked as a journalist in The Irish Times and, between 1984 and 1986, was associate editor of Noticias Aliadas in Lima, Peru. He is now an adjunct professor in both the University of Iceland, Reykjavik and at the National University of Ireland, Maynooth. In the autumn of 2012 he held the UNESCO Chair in international development studies at the University of Valencia, Spain. He has published widely on society, economics, and politics. 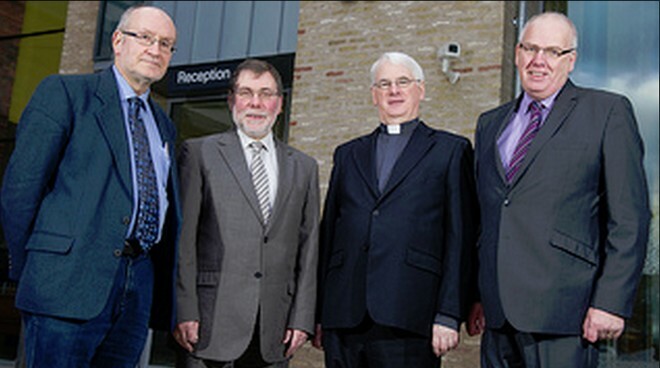 The Northern Ireland Catholic Council on Social Affairs is the Northern Ireland sub-committee of the Council for Justice and Peace of the Irish Bishops’ Conference. With a membership of mostly lay Catholics with relevant experience and expertise, NICCOSA provides advice and support to the Catholic Bishops of Northern Ireland on social, legal and political issues. The Council is chaired by Cardinal Seán Brady, Archbishop of Armagh and President of the Irish Bishops’ Conference, assisted by Bishop Nöel Treanor, Bishop of Down and Connor.